Hi ya hun, What'll ya have today? Let me tell ya about our specials... yah, they come loaded with the works, just the way you like it, served up hot and fresh with all your favorites! These Diner-Style Counter-Top beauties are sure to be a Hit. Play all your favorite tunes from anywhere there's a Rock-Ola Wallette Music Selector. Fits Any Location... Plays any SyberSonic Jukebox. Wallette features real chrome plated die-cast metal cabinet with lighted plastic pillars, lit selection buttons and it's own stereo speakers. Has Volume High, Low or Off switch. Holds 50 or 100 title cards. 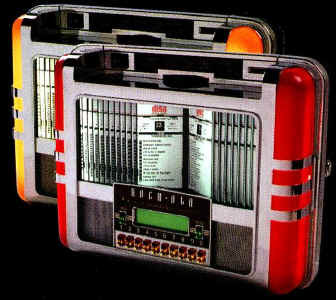 Unit is powered by host jukebox. Mounts to wall or can be counter top mounted with optional mounting kit.